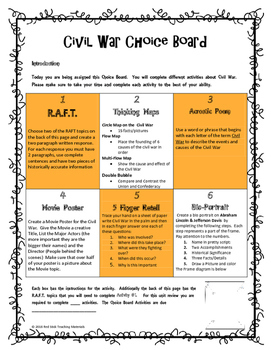 Let your students choose how they show mastery surrounding the topics of the Civil War while integrating writing and literacy skills through this choice board. 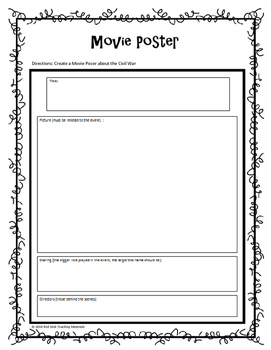 Two different formats and work sheets are included. 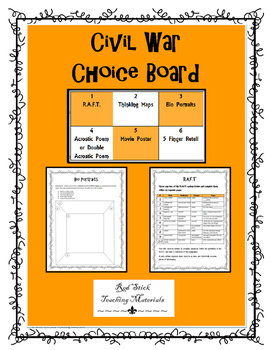 Format B—each student will need the choice board with the instructions and descriptions. They will then complete all activities on their own paper. 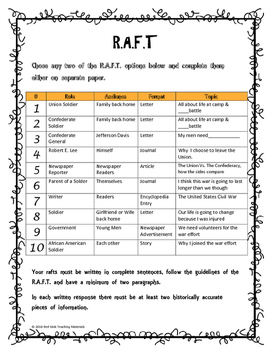 These activities also make great Interactive Notebook Entries! If you like this product or are looking for more hands-on social studies resources, please follow my TPT store. This way you will receive updates when new products become available. Also, remember to leave feedback on all purchases to earn credits towards future TPT purchases! Remember that you can Earn TPT credits towards future purchases by leaving feedback!